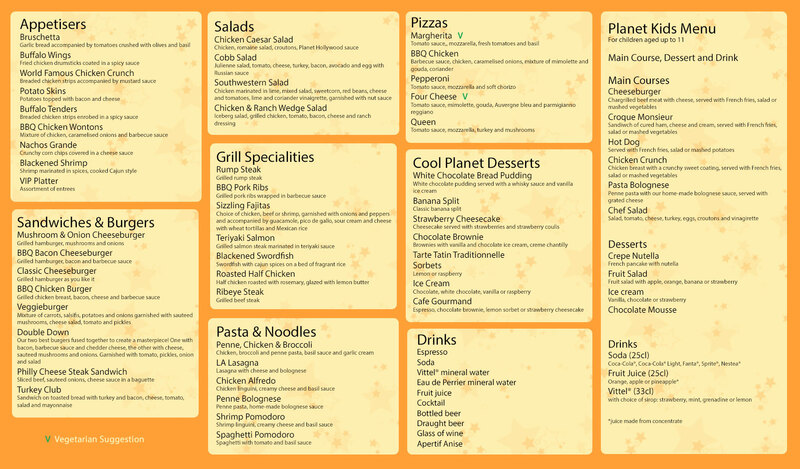 Below you will find some example menu's of restaurants at Disneyland® Paris. These are to give you an idea of what type of food is available, they are subject to change at any time, we can not guarantee any of these items will be on the menu when you visit, they are merely as a guide. Some restaurants become very popular at peak times and we would recommend that you pre-book your tables at some restaurants in advance through the Disney Dining Reservations line on 0330 123 1645 and Option 4. If you don't do this in advance of your trip then arrange with the concierge at the hotel the day before.